At PPP we don’t limit ourselves to any one market as we’re always looking for an opportunity to innovate. Sure, we have lots of customers that fall under the Food, Food to Go, Health, Beauty and Lifestyle markets – but if someone comes to us with a packaging problem, like ensuring e-cigarette oil packaging stays within the rules, we’re 100% ready to offer them a packaging solution. Case in context: Big changes in health are happening in the UK. Mainly to reduce strain on NHS resources, non-branded cigarette packaging was introduced as legislation. You may have seen it recently in shops (dull green packaging depicting graphic images of the effects of smoking – nasty stuff). Queue the introduction of e-cigarettes that are proven to be 95% less harmful than cigarettes and have helped 1.5 million people give up smoking entirely. With approximately 2.6 million customers in the UK, competition in the e-cigarette industry is rife. So if you’re just starting out, where do you start? Well, you’re going to need some help – and it starts with packaging. 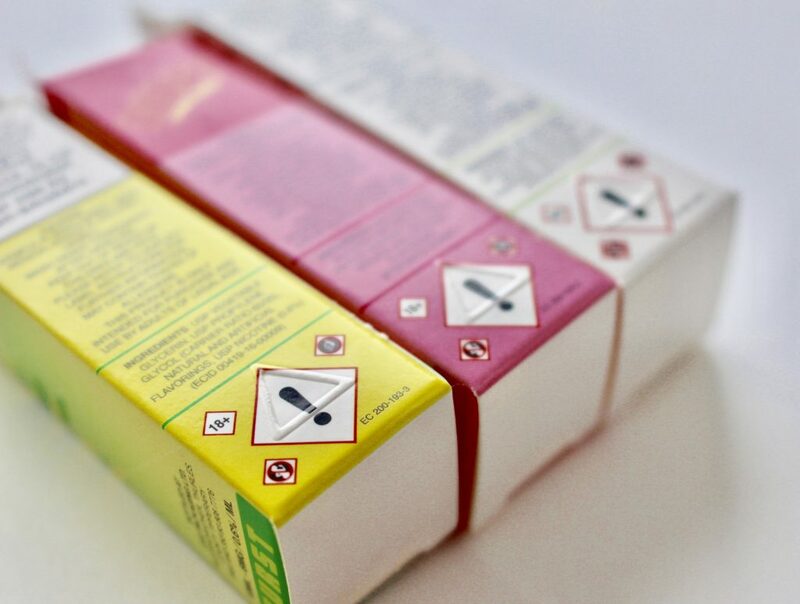 Packaging will always be important, but in the e-cigarette vaping oil market it really will make or break your product. Customers need to be informed about your product via your packaging and you need to comply with regulations. We’ve already done our reading up and know that all UK vaping packaging must have nicotine and government warnings that take up 30% of the front and back of the packaging. In addition, we recently printed braille embossed packaging for an e-cig customer who required it for the warning labels on their packaging – and we’re one of the first UK companies to do so for e-cig packaging. This makes the printing of the packaging slightly more bespoke, but like we said – we’re open to innovation. If you’re considering entering the e-cigarette market and are worrying over the warnings – enquire about our expertise. Our thorough process will guarantee your packaging will comply with legislation. So here’s what we can do for you: Print individual vaping oil boxes, multi-packs (holding more than one oil) and easy to assemble shelf-ready packaging for your suppliers with grab and go ease for your customers. PreviousPrevious post:Iconic Packaging from See.SenseNextNext post:Why Window Patch ?